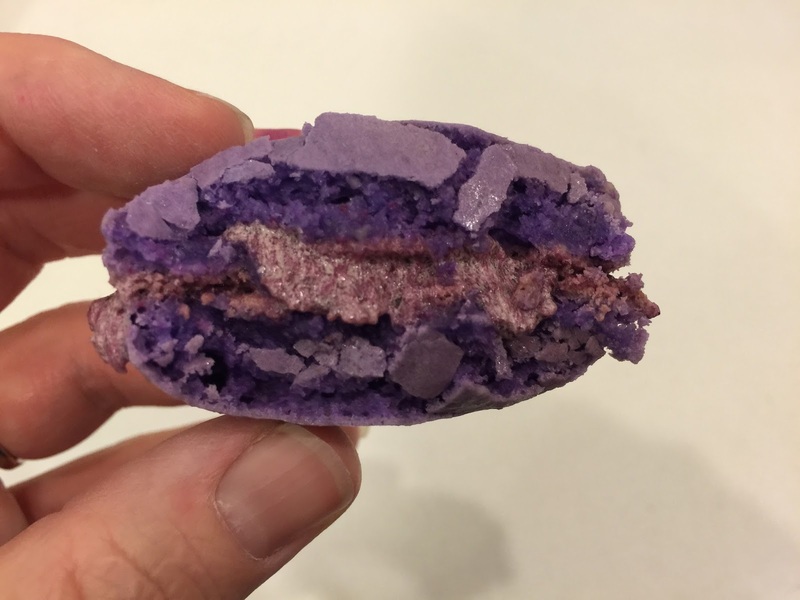 Macarons are something I try to bake every now and then, tweaking my recipe as I go. My first batch came out lumpy and dull with no 'foot'. I have gradually progressed to the point where I am happy with my recipe, just need to refine my technique a bit. My last batch came out looking beautiful (though not yet perfect) and they tasted brilliant! Blitz icing sugar, ground almonds and salt together in a food processor. Whisk egg whites to soft peak, then gradually whisk in caster sugar until thick and glossy. Add a few drops of food colour and whisk through. Sift half of the almond mixture into the egg whites and fold in until well combined. Sift the rest of the almond mixture in and fold together until all lumps are gone and it looks smooth and glossy. The mixture should be thick enough to hold its shape when piping. Be careful not to over mix. 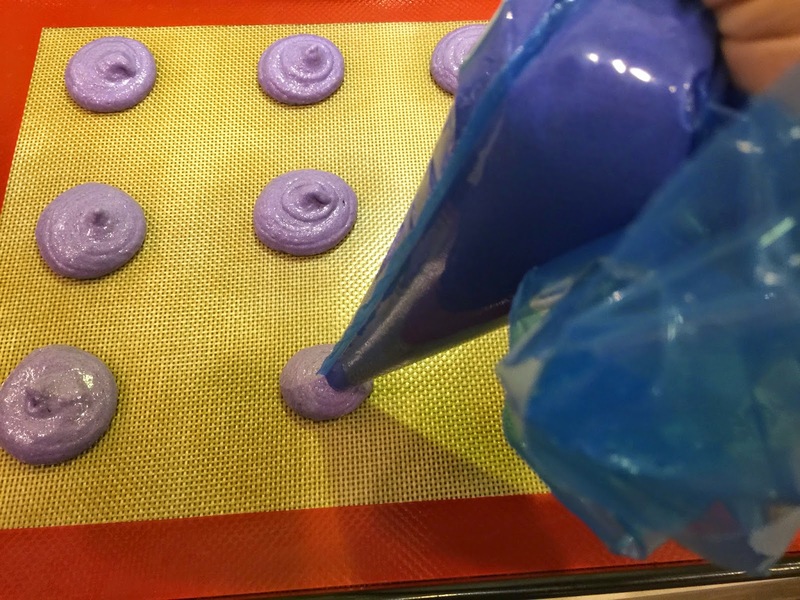 Scoop into piping bag with a 1/2" round tip, or a disposable piping bag with the tip cut off. 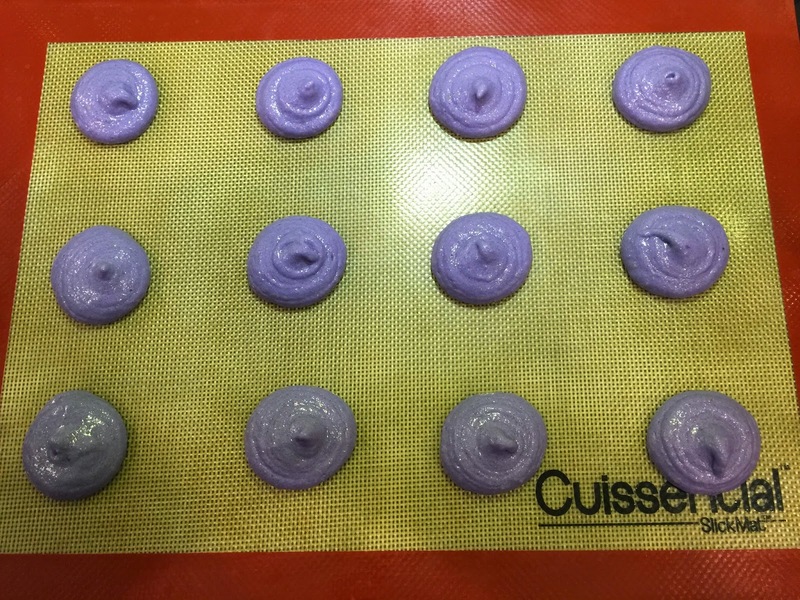 Pipe rounds onto lined baking trays (line with non-stick baking paper, silpat or similar - don't use any fat). Tap the tray on the counter to encourage air bubbles to rise to the surface. Use a damp finger to smooth down points from piping, as well as any other irregularities. Leave to stand for 20 minutes to allow a skin to form. Bake for 15 minutes, until they can be easily lifted off the tray. Don't allow them to brown. Allow to cool, then sandwich with filling of choice. I used a blueberry buttercream for these, but I think I prefer a ganache as it has a richer flavour.